I couldn't find anything for this Bible lesson online, and it has been one that I have taught for years. There are teacher's visuals for you to print and a student workbook to match the visuals. I had the students fill in the blanks as I taught the lesson. There is also a bee door hanger craft. This is the basic lesson, with a lot of discussion while students write in their workbooks. I basically have the scripture (Romans 1:28-32) and general definition of the words, and then we discuss what it means to them. Each class will be different, depending on age and issues in their lives. (1. Bee Obedient) Paul writes about different sins several different times in his letters. Today we are going to learn about one of those lists that he wrote. Paul was in Corinth when he wrote this letter to Rome. He says in Romans 1:16 that the gospel is the power of God unto salvation to everyone that believeth… He wants them to know that God expects us to live and act a certain way and these things that he writes are what God wants. He expects us to obey Him. (2. Bee Respectful) Paul also talks about being respectful. He said not to be a backbiter. God doesn't want you to talk about your friends. And, if you are with your friends and they start talking about someone, you should ask them to stop. Paul said God doesn't like it. Discuss how it can hurt people's feelings and upset them. (3. Bee Content) God wants Christians to be happy with what we have. He doesn't want us to look for more, or better THINGS. Be satisfied with what you have. (4. Bee Truthful) We all know what telling the truth means. It means don't tell a lie or be honest. It means don't do something if you know you are not allowed to. (5. Bee Courteous) Paul tells us not to be violent. This means being cruel. So the opposite is courteous. If you are courteous, you are polite and show good manners. You are friendly and not mean. (6. Bee Kind) God wants His people to be generous with what He has blessed us with. This can mean several things. We can share our toys. We can also help people when you see something that you can do. Be nice to your pets. Etc. (7. Bee Forgiving) Even when someone does something to upset you, or says something to hurt your feelings. Forgiving is also forgetting! (8. Bee Happy) We should be happy! We don't always get what we want. Or, what we think we need. But God will take care of us. Again, this means being satisfied with what we have and not always wanting the newest thing. (9. Bee Loving) This should be so easy! Love God first! Love our family, our church family, friends, neighbors, etc. God made us all. (10. 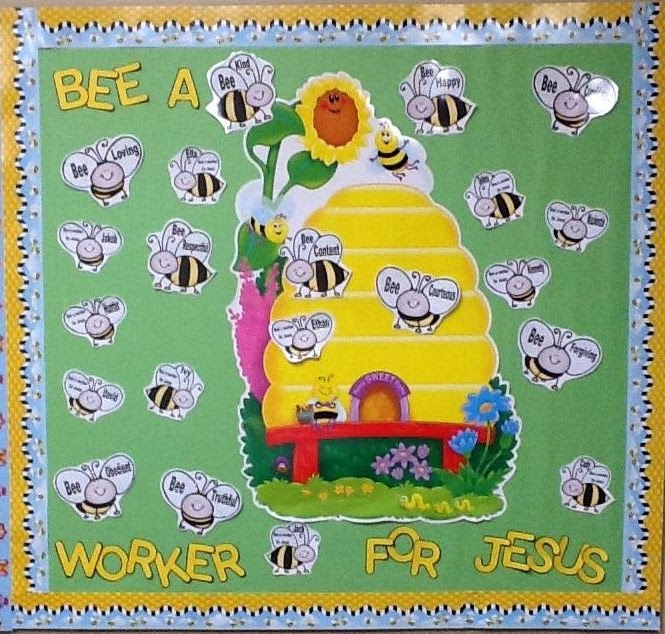 Bee Considerate) Paul tells us to be kind and loving and forgiving like Jesus. Considerate means being understanding and thoughtful. Kind. Just be good to other people, like you want to be treated by them. You think about other people’s needs before your own. You think about their feelings before you say something that might hurt their feelings. For today's project/take home, I made these door hangers as a reminder of how God wants us to be. 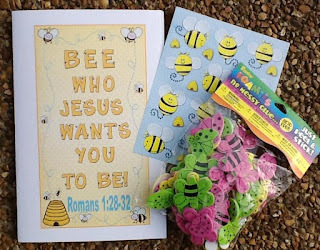 The kids will cut out the door hanger (unless you cut them out before class) and the bee in circles are on the side for them to cut and glue however they want to. You can print it here. This is the bulletin board I used with this lesson. The letters were cut with my Cricut machine with the Learning Curve Cartridge at 3 1/2". You can print the bees with the "Bee..." here. You can print the student bees here. The hive is from Trend (T-8077). You can find it here. And, the border is Bees & Honeycomb (CD-4001), and you can see that here. I found you at Manic Monday. Thanks for sharing this adorable set. Bee Ready - amen! I especially like the workbook and doorknob hanger, and will pass them along to my homeschooling daughter. Thanks for the nice comment! I really appreciate you passing it along to your daughter! Thanks for visiting! Love your BEE like Jesus theme!! Found you through Manic Monday! I just love these BEE FREEBIES! 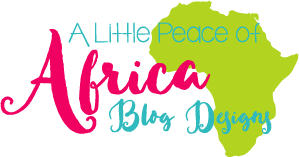 :) I am glad I found your blog! Your freebie and your blog are too adorable. I just found you through Manic Monday. Thank you! Thanks for stopping by! I appreciate the nice comment! Your blog is wonderful, I came back over from Manic Monday! Thanks for stopping by! And, Oh... I love your blog! Thanks for the nice comment! Thanks so much for stopping by! I appreciate it and thanks for hosting! Thanks for stopping by! I added back as a Google+ and Google connect. I also left a comment about the picture resizing on blogger, and if you find an answer, I would love to know how to fix it, because I am having the same problem! It just started one day and it is annoying! Thanks! 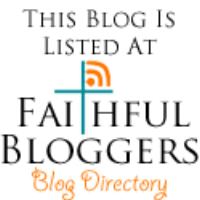 I am visiting from the Homemaking Blog Hop Party! 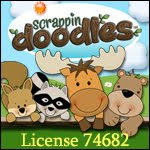 I look forward to your visit at http://www.homemaker-mom.com/the-homemakers-journey-blog.html ! Happy homemaking! Thank you for visiting! Pinned the Tater Tot recipe from your blog, it looks really good! Thanks so much for stopping by! I appreciate it and thank you for leaving the comment! Thanks so much for stopping by! I appreciate the nice comments! Very cute theme! Thanks for sharing at Mom's Library! This represents a ton of work and I am so grateful to be given permission to use it. Thank you...this is awesome. I so appreciate that you took the time to link up with me last week at Walking Redeemed. You are a blessing! Thanks so much for hosting! I really appreciate it! Thank you for the nice comments! I appreciate the comments and that you took the time to visit! Thanks so much for stopping by! Appreciate you pinning it! Very cute. When teaching the youth about joy we were very clear that it's not the same as happiness, as that is an emotion that comes and goes. I agree that we should find contentment and joy in Christ but I'm more cautious teaching that we have to be happy.